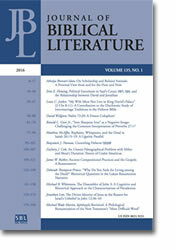 SBL membership includes a free online subscription to the Journal of Biblical Literature published by SBL Press. If you are not currently a member of SBL, please click here to learn more. The SBL Hebrew font is used in JBL beginning with vol. 125, no. 1; SBL Greek is used beginning with vol. 130, no. 1. The Greek, Syriac, Coptic, and transliteration fonts used in JBL prior to vol. 126, no. 3 and the Hebrew font used prior to vol. 125, no. 1 are available from http://www.linguistsoftware.com, +425-775-1130. The flagship journal of the field, the Journal of Biblical Literature is published quarterly and includes scholarly articles and critical notes by members of the Society. Essential reading for over a century, it is now available online and in print. The Presidential Address, presented at every Annual Meeting, is transcribed and published in the first issue of the following year.